If I could only eat one thing for the rest of my life, the answer would be easy: strawberries (notice to the right - an email cupcake, with a strawberry no less). If I could only eat two things for the rest of my life, I would add cream to that endless supply of strawberries. 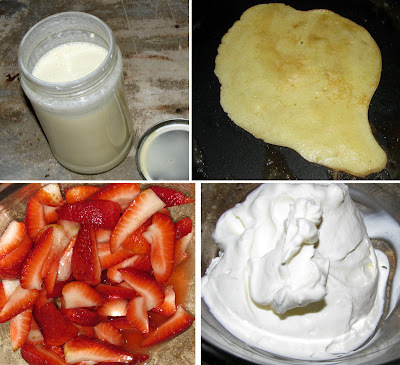 And, if I could add one more thing to that list: crêpes. Every summer growing up, as far back as I can remember, my family went strawberry picking. It is such a staple in our family tradition that this past Christmas, my amazingly talented sister, Pamela made my parents a Family Tree Quilt. 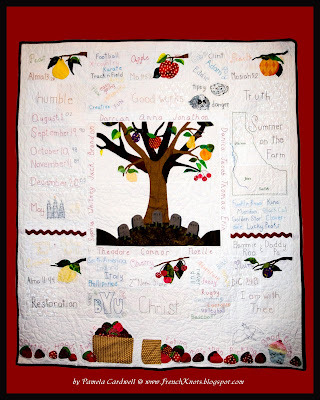 Check out the bottom of the quilt; a crate of strawberries and each of our memories of being in the field embroidered. I can think of no better word to describe picking fruit, than spiritual. Although you are among friends, it's truly an individual process. Sifting through the patch within the immense field, inspecting each and every berry on the vine and weaving your way through the red and green labyrinth. I was also fortunate enough one summer to pick peaches in an orchard in Alabama. In fact, if I were able to add a fourth thing to my list of infinite quantities of limited types of food, it would be peaches. When picking peaches, it is effortless imagining that the entire universe is contained easily in that one solitary tree; for that tree, within the orchard is all that can be witnessed in what appears to be an all encompassing scene. If you follow Gabriel's blog (which you definitely should) you already know that about a week ago I filmed my first TV cooking show! If you live in Oregon you'll be able to watch me over and over and over about 50 times on Cable Access, and if you are not a local, don't worry I'll post the episode here. 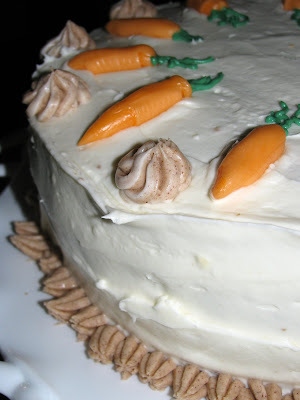 I do also want to give props and credit to Evan, at Butter Cakes, who posted the idea and instructions for creating the Starburst Carrots you see adorning my cake in the photo above. 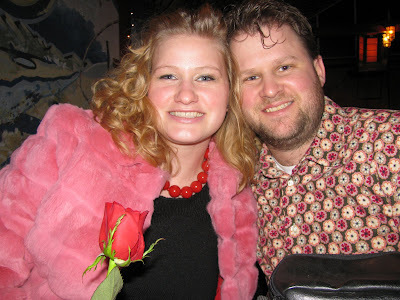 I've been really excited to write this post, because let's be honest, part of being a girl is bragging about the wonderfully romantic things your significant other does, and publicly... makes it even better! I love holidays (this you know) and I pretty much handle all the holidays in our home, except for Valentines day. That is Gabriel's holiday. I heard a lot of chatter this year pooh-poohing Valentine's Day, most of it along the lines of, "You shouldn't need a holiday to say I love you." This really bothers me! Partly because that isn't the point of the holiday, and partly because we set aside a day to celebrate a jolly fictitious bearded fat man on Christmas, an egg loving Giant Easter Bunny, drunken hordes on St. Patrick's Day, and thus Valentine's Day should be the one holiday that we revere above all others because of what it symbolizes! It's just one extra day to reverence the immense magnitude and power of love. Je t'aime Gabriel, mon amant! Gabriel started the festivities the evening prior when he brought me home a bouquet of fresh purple daisies (daisies are my favorite, specifically Gerbera Daisies). We were up late on the 13th - I was making chocolates and Gabriel was working, so the next treat was to sleep in, after which I gave Gabriel his traditional box of chocolates and he presented me with a fresh bouquet of red roses and a box of French chocolates which announced his theme: A French Tour of Portland. Next to our home is an apartment complex named: The French Chateau. Naturally, our tour started there. At which point I gave Gabriel another traditional gift, Hot Hearts. 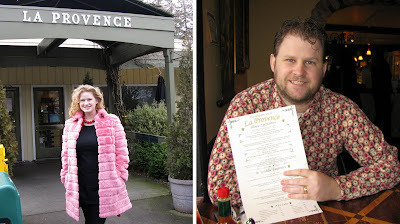 We then headed over to La Provence, and enjoyed a delectable breakfast. La Provence is an excellent eatery on the SW side, specializing in baked goods and desserts, but a restaurant as well, which serves breakfast all day long. They present a delightful atmosphere, great service, and delicious menu selections. 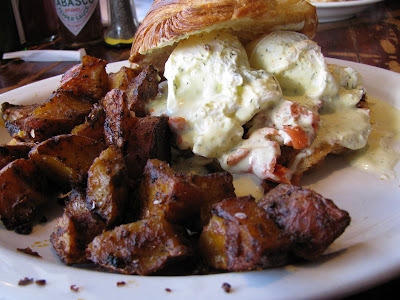 Gabriel chose the Salmon Hash (salmon and hash browns adorned with two over easy eggs), and I opted for the Eggs Neptune (smoked salmon and poached eggs on a croissant with hollandaise sauce). 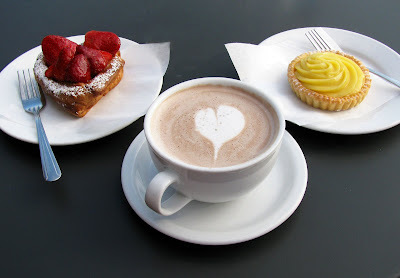 In Lake Oswego we had a romantic walk along the bay, and had lunch outside at St. Honoré (the patron saint of bakers) Boulangerie overlooking the lake, and shared a steaming cup of hot cocoa. We also enjoyed a St. Valentine. and Tarte Aux Citron, also shared, of course. In North Portland we found a quaint little Asian French Bakery, we just peeked in, and then attempted to get a treat at Cafè du Berry, but unfortunately they were closed and booked for dinner for the evening, although the chef let me know I was dressed perfectly for Valentine's Day. Following these two stops, we headed downtown to visit the French Quarter which sells the most beautiful linens and pillows. 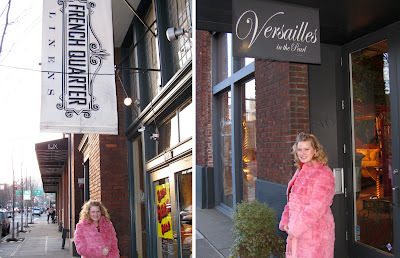 After that, we walked a few blocks to Versailles, a French furniture store with the most exquisite furnishings! When we lived downtown we would often walk by a popular park and see groups of people playing a game with metal balls. We learned in Versailles, that game is called Boules, and in learning this struck up a conversation with the owner of the furniture store. He recommended for us to have dinner at a restaurant on the SE side, Chez Machin. It turned out to be perfect, or should I say more appropriately, quelle coïncidence! When we walked into the picturesque French house, the entire restaurant was covered in tiny sparkling lights, each table had one solitary fresh blooming red rose, and in the corner, sitting at a small two person table, was a young man singing French love songs and playing the guitar. It was the consummate experience. Naturally, dinner was amazing! We started our meal with the Plateau of Frommage, seasonal fruit with baguettes, brie and blackberry sauce, followed with a shared cup of salmon chowder. For the main course, Gabriel opted for linguine with mussels, and I enjoyed a savory crepe with tomatoes, avocados, chicken, and brie. Finalè: Fresh Red Roses and Purple Daisies, Chocolate Covered Strawberries, Scratch Made Chocolates, Chocolate Ice Cream Cake with Peanut Butter Ice Cream, French Chocolates and a French film: Le fils de l'épicier. 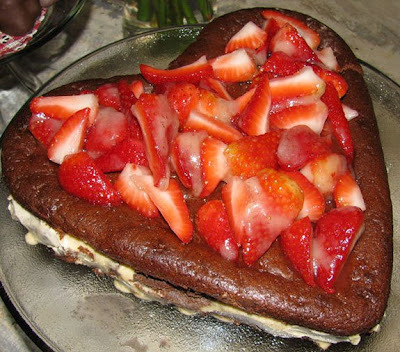 When we arrived home, Gabriel made a bed of blankets and pillows in the living room and we watched a French Film, The Grocer's Son whilst eating cake, strawberries and chocolates. And of course, gave the furries their Valentine's Gifts - a new squeaky ball and a stuffed hot dog! I don't think Gabriel will ever truly understand how much this romantic day meant to me. It was a beautiful representation of his love for me, and I will fondly remember it forever. My very first "real" job, real as defined as having taxes withheld, was at See's Candies, and I worked there for 6 years. Okay! I lie, my first job was at Kienows, a small local grocery store stocking the shelves and helping patrons out to their cars with their groceries. The assistant manager hated me though, and was a beast to work with. I only lasted 2 weeks because the day I quit, I was working the late afternoon/evening shift. I arrived to work and the assistant manager immediately let me know that a child had thrown their whoozeewhatzits all over the bathroom! But the thing was..., it happened earlier that morning and she had left it there all day!!! Then she made sure to let me know she had left it there all day, waiting for me to come in to clean it up. I love to tell people the story of how I got hired at See's Candies. During my interview the manager, Steve, asked me, "Why should I hire you?" I answered, "Because, I really want this job!" I thought it was a great example of how confidence can get you places. I found out years later, it turns out, I got hired because Steve was a pervert. And that makes sense, because c'mon really, how original is, "I really want this job!"? Nonetheless, I loved working at See's Candies. The pay is excellent - really, and you get to eat all the candy you want as long as you are on the clock. Plus, every 5 years they send you and your spouse on a free trip to San Fransisco. Unfortunately, the rest of the people you work with seem to have a tradition of being cranky. Gabriel and I started a tradition the year we were married of exchanging heart shaped boxes of candy on Valentine's Day, from none other than See's Candies. For the past several years, I have given Gabriel a heart shaped Tuxedo box, and every year he presents me with a heart shaped Red Satin box; 1 pound each of our favorites. For Gabriel, that is a majority of Rum Nougats. We still talk about how some day when we have a disposable income it would be fun to go and pick out our favorites and fill the incredibly massive 5 pound Pink Velvet box..., someday. 2 years ago Gabriel and I altered our tradition a little, from filling heart shaped boxes with See's Candies, to filling them with my scratchmade chocolates! The process is a labor of love, and well worth the time and effort. 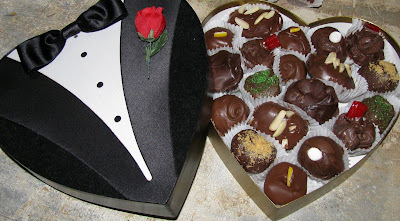 However, since Gabriel already knows that he is getting a fresh box of Fahrenheit 350° chocolates every year, and is present while I labor extensively over their creation, the surprise is that each successive year I create new flavors to give him. So, let's move on to Step Two of making chocolates! If you missed Step One - click. This process, although tedious, is fairly simple. Be sure each time to clean your bowl and utensils well, you don't want to mix and cross flavors. Here are a few of my creations. Or,... purchase them from Fahrenheit 350°. I tried to get Melinda to select a birthday cake of her choice, but she's so sweet she let me choose, and that is actually more of a birthday gift to me; thank you. 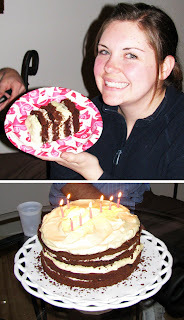 Last year she chose chocolate banana cake which I interpreted as 8 layers of alternating chocolate cake with banana cake, interlaced with chocolate frosting. Last year of course I didn't have a camera, but it was an exquisite beauty. Also attending the celebration last year were our friends the Marleys. 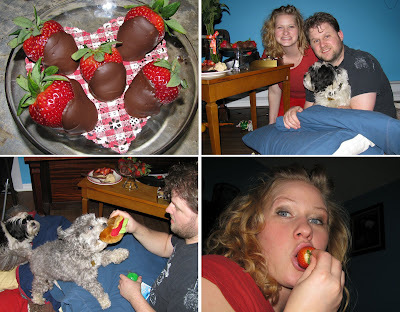 We chose Melinda's celebration to film my audition tape for: Deal or No Deal. The Marleys and the Lloydlings, along with Gabriel, were my supporters and in our video we pretended Howie was over for dinner and dessert. We wrote out a little script to perform and directed all our attention to Howie (the camera). I wanted to include my audition tape, but our video camera hates us and wouldn't transfer from the camera to the computer. We've been trying to transfer for several weeks and tonight in fact, it crashed the computer and created a huge fiasco that we are still trying to recover from. So, no video. Let me try and recreate the scene for you though. In the first video we had one really great scene at the end when I started cutting the cake, and if I were a videographer, at all, I would have done some super fancy movie magic and spliced the scenes. What happened was that as I was moving Howie's piece of cake from the cake platter to Howie's plate, because of my misjudgement of the height and weight of the piece, I lost control and it splattered all over the table. What followed was a picture perfect response, we all gasped, looked at the camera with pulsating neck tendons and clenched jaws... and then everyone looked at me... and gave in to laughter. We only had the one cake, the one shot at getting it right, but really we gave in to laughter, at least I did, because I realized it made the scene perfect! The second take overall was much, much, much, much, much better. In fact we held scripts throughout the whole taping which I got a huge kick out of. We had a little bell that I practiced hitting the "deal" button with, Gabe and Benj were slapping high 5's to each other, Gabe kept stealing everyone's food, and I couldn't stop laughing, so much that everyone else had to fill in when it was my turn to talk. It was hoolarious! For Melinda's birthday this year I chose a chocolate almond cake with alternating vanilla mousse and walnut cream frosting. We started off dinner with a slow roasted garlic lime chicken. Add to that sour cream mashed potatoes, oven baked parsley spiced carrots, and a simple side salad with bell peppers and mushrooms. The most simple and the most delicious meal. 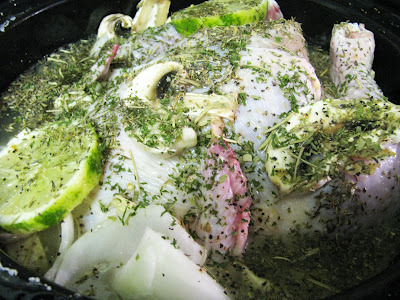 One whole chicken, rubbed with olive oil in a crock pot on high. Add large chunks of 1/2 an onion, 1 sliced lime (seeds omitted), cloves from one garlic bunch, sliced mushrooms, rosemary, thyme, oregano, parsley, salt and pepper. Fill the crock pot half full with water. 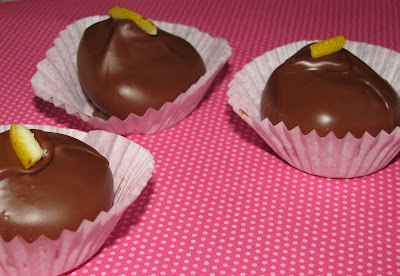 You can substitute the lime with oranges or lemons or your choice. Cover. Flip after 3 hours, done in 6. 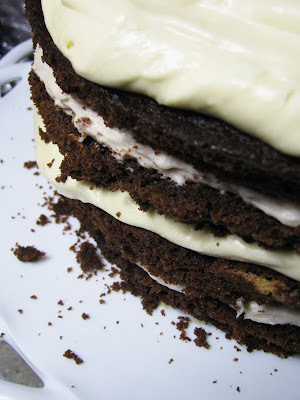 This is a smooth thick chocolaty cake with an airy yet rich texture. For me, a deep chocolate cake doesn't need more chocolate frosting, so for a while I've been trying to come up with the perfect accompaniment; this is it. 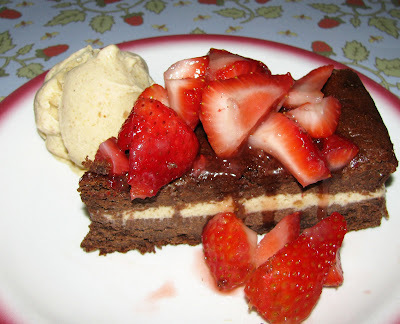 The proportion of almond to chocolate is harmonious, and is enhanced by a creamy mousse. Whip egg whites and fold into mixture. 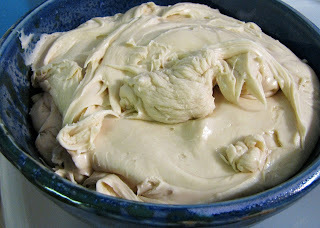 Don't over mix, allow some of the whites to remain lumpy. I knew the cake topping needed to be a vanilla mouse, but I considered all week what to put between the sliced layers of cake... more mousse? chocolate frosting? almond butter? 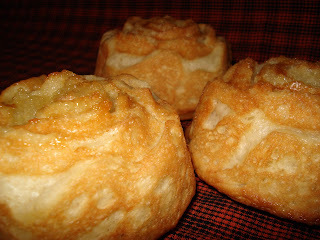 and when I looked in my fridge and saw the remaining cream mixture from the Walnut Pear Tartelettes, I had my answer. Since you've already spread your walnut cream frosting between your two layers, simply spread your mouse between your two cakes and on top. Violà! 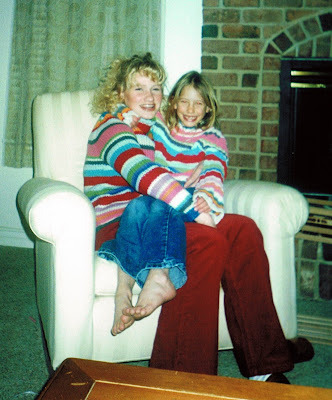 I think I was about 17 when I caught wind that my mother was taking my older sister Tina to visit my Grandmother in Boise to learn how to make chocolates. Unfortunately, I learned that I was not invited. Who was invited, other than my mother and sister? my 6 old niece aptly named Catherine (my favorite name)! I thought that was ridiculous! I rarely got to see my Grandmother, and Tina spent her summers growing up on the family farm! 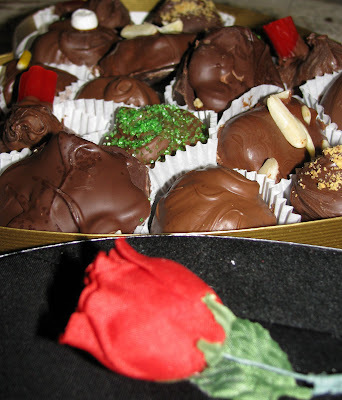 Plus, it was time I got to learn how to make those chocolates! So, I finagled a way to secure an invitation: I offered to babysit. After all, how were they going to concentrate on making chocolates when a little child was running around? I knew however, that the the allure of Boise antique shops would be to much to resist, and I would have Bammieroo all to myself. I was right. They spent a few minutes at the house, but mostly the two of them were out and about picking up discarded, dirty, dusty duds. They missed all the fun!! Catherine and I made a fun memory book of our time spent together with stickers, paints, and pictures, we watched a pirated DVD of the Titanic filmed from a theater with no sound that Bam picked up from a street vendor in NY, explored for hours outside on the acres and acres of land on the property, and flavored and dipped chocolates. This blog entry will catalogue step one of candy making. First, we will go over a couple must have things you need before you can get started. Most importantly is a heavy durable pan, ceramic, enamel, or waterless aluminum. Waterless aluminum is not your typical grocery store pan - a famous brand would be a Guardian Service pan, touted as being practically bullet proof. Regrettably you can no longer purchase these pans, but you can find beautiful enamel pans made by Le Creuset, or wonderful ceramic pans made by Calphalon, even at discount stores like Ross and TJMaxx. Also, the pan can be no smaller than 8" in diameter, and 4" deep. Second, it is in your best interest to have a stand mixer with a kneading hook, like a Bosch. 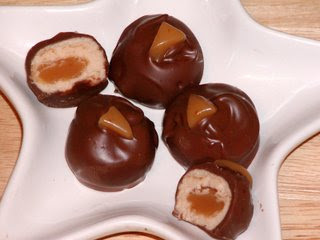 I know that you can make candy without it, and I know that my Grandmother used to do it as well as countless other people, but I don't know why you would want to. And you must have a lid - no exceptions! Lastly, a marble slab, or some concoction that you can pour boiling liquid onto. 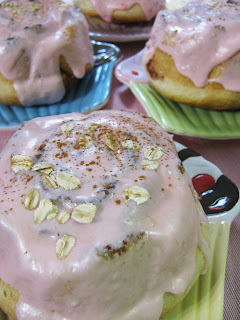 In your pan mix 2 cups sugar with 1 cup of cream and 1 tablespoon Karo syrup with a wooden spoon. Place on burner and turn heat to med-high. Cover with lid, or substitute lid with aluminum foil. Do not stir. Allow mixture to boil and rise to the top of the pan. This will prevent crystallization of the sugar, and speed up the cooking process. Once mixture has reached the top of the pan, remove lid and add 1 tablespoon of butter. Continue to cook until mixture reaches hard ball stage. Don't rely on a thermometer, this is old fashioned candy making, so leave modern appliances for the grunt work. 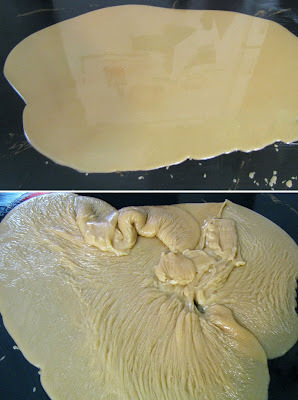 Once candy reaches the correct stage, pour onto well buttered marble slab to cool. The purpose for pouring the candy onto the slab is that you want to end the cooking process immediately. If it cools in the pan, it will continue to cook, and you will no longer have creamy candy fondant. Allow the candy to cool until it comes up easily off the marble, and looks a bit wrinkly when contorted. 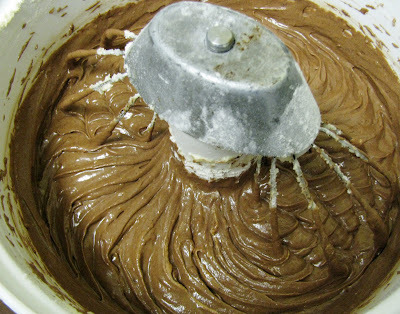 Scoop candy into your mixer and turn on high. Or, if you choose to make the candy without a mixer, get out your wooden spoon and start weaving circle 8's through your fondant. While mixing, your candy is going to go through 3 distinct stages; my Grandmother called this 'turning'. Depending on how long you cooked the candy, how long you let the candy cool, the temperature of your kitchen, the weather, the time of year, etc. etc. will determine how long this process takes. My best advice is to be patient. In the best of times it takes 10 minutes, but I have patiently screamed at my mixer, the candy, and my husband while waiting 2 hours at times. My mother always says, "Just wait,"; she always seems to be right. The first stage is fairly close to the same consistency as when you poured the candy from the pan. 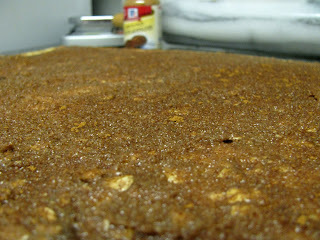 It is smooth, buttery and resembles caramel in look and taste - but better. This is the longest stage. The next stage happens fairly quickly, and if you are reading or watching TV during your mixing you could miss it. If you have a 2 hour marathon mixing event I highly recommend watching TV or reading, and pulling up a chair, but do not leave your mixer unattended. It is a vigorous process, and needs one hand on the mixer at all times. The second stage is crumbly, and resembles pebbles in look only. The last stage is smooth again, but your fondant has turned from translucent to a shade of white. 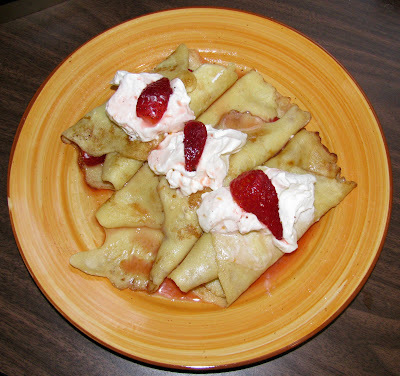 It is creamy and sticks to itself, not the bowl, and is sweet and delicious! Place all of your completed fondant into a bowl, or Tupperware to cure, just make sure it is wrapped up tight. At this stage your candy will turn rock hard. This process takes a minimum of 3 days, but can last afterward for months in your fridge. Keep in a separate drawer, or away from any smells which it could absorb. Check back in a few days to see the next step in our candy making process. 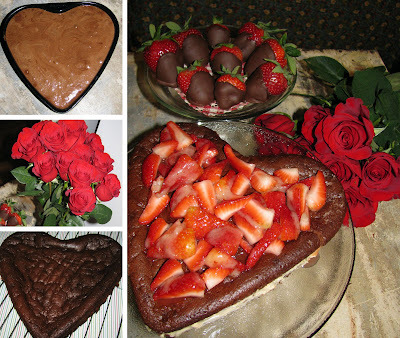 If you make your candy today, your candy will be ready for the next stage on the 12th, and just in time to give to your sweetheart and WOW them on Valentine's Day. If you have any questions about the process - please feel free to email me and I will promptly respond! 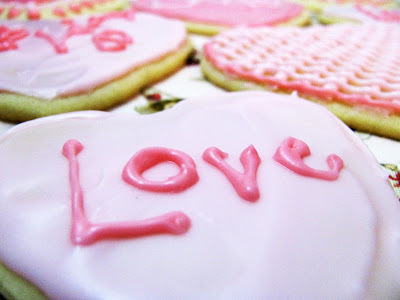 I've been inspired by my sister Pamela this February; hence the Valentine Sugar Cookies, and the pink frosted Cinnamon Roses, and now Delicious Chocolate Cookies. 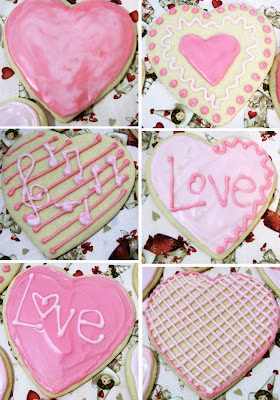 She has a beautiful fun blog, French Knots, and she's dedicated February to Valentine posts - one for every day!!! And they each are inspiring and creative! 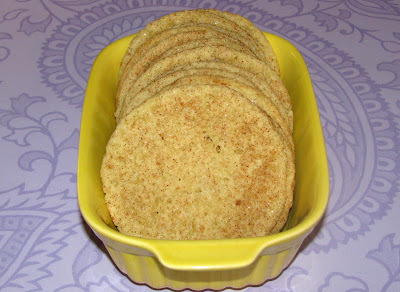 Towards the beginning of the month, she posted fabulous looking cookies with the recipe, and darling pictures of her little boys eating them. I may steal those pictures because I have no darling little boys of my own, however, I do have an adorable little household tail wagger, who loves butter as a vocational obsession - so she's particularly happy when I'm baking, which probably goes without saying is all the time. In fact, Tipsy has learned how to pry open the cupboard door which houses the trash basket, with a combination of her nose and her paw, to pilfer the coveted discarded butter wrapper. 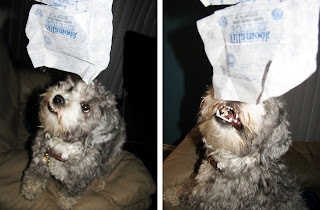 She's actually not big enough to reach the top of the canister to actually steal the wrapper, so I'm convinced she does this to torment me with her cuteness - because seriously - why else would I let her push an oily, sticky, messy butter wrapper around the floor to her heart's content. 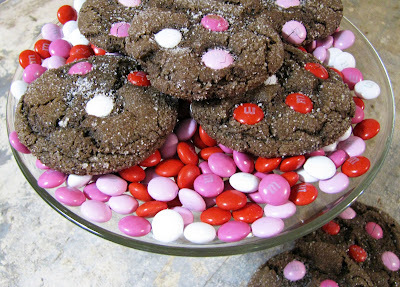 Pamela posted this recipe on February 3, and it has taken me since then to find a bag of Cupid Mix M&M's. I tried Target: nope, Fred Meyer: negative, Winco: seriously?, Safeway: doesn't anyone celebrate Valentine's?, and finally Albertson's: Ssssssssuccess! Tipsy and I were both very excited! Me, because I got to bake these cookies I've been salivating over, and Tipsy, because she got to lick butter wrappers. These fudgy cookies are divine. They are dense enough to possess a full flavor of chocolate in each bite, but soft enough to melt in your mouth slower than you are able to devour them. And they transmit love and the meaning of Valentine's just by looking at them! Plus, I have a special place in my heart for the M&M/Mars company. 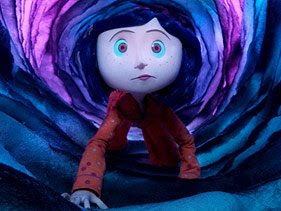 In my last post I talked about LAIKA; they have two divisions: an entertainment division which made Coraline, and a house division which makes M&M's commercials (among others). If you ever find yourself watching an M&M commercial, chances are Gabriel worked on it. 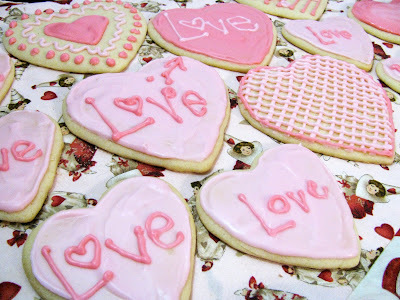 Since the sugar cookies only found their way to one family, ooooh they were just soooo very good, perhaps these will make the longer journey; but I'm not making any promises. P.S. 6 days left to vote on my poll! Gabriel and I thought it would be fun to try and watch a religious movie together every Sunday. This past Sunday we watched Gods Army 2: States of Grace. Truly, this is the perfect title for the film; a story of atonement, redemption, and pure love. For me, Sunday's used to be a lazy day of napping, watching TV, and mostly just not working. Recently though, Gabriel and I decided to try and make our focus on Sundays as God has commanded... sacred and holy. For us, this has meant giving up the internet and the television on Sunday. We'd opted instead to write a letter each week to friends or family, watch an LDS or religious film together, and attempt to create an atmosphere that reflects our commitment to living more Christlike. I have to confess that through sickness and upheaval and a variety of other unjustified excuses the past couple of weeks I've completely abandoned my new resolve... until this past Sunday. Watching this film reminded me of what I feel is truly important in my life: My relationship with my Heavenly Father, and my Earthy and Eternal Family. Inscribe the letters LOVE all over them! In addition, I've added a new poll to my blog. 10 days left to vote!! Also, I've joined the Daring Bakers! I'm thrilled to be a part of what I consider a baking movement, and I look forward to testing my skills through each challenge!